For the past three years, third grade students at my school have been recording beloved family stories for our annual culture fair. This project was inspired by NPR's Story Corps and weaves together many reading, writing, and social studies state standards. Students are encouraged to talk with family members about their history and culture. After writing down their stories or memories, students step into our "recording booth" and record themselves reading. My partner and I have "displayed" the recordings in many different ways over the years. 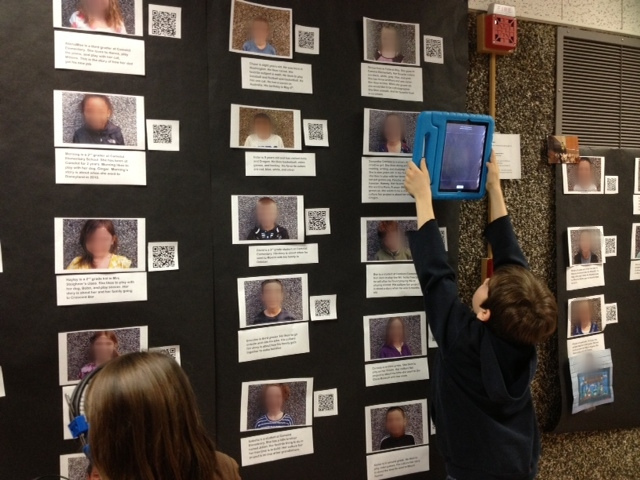 This year's audio QR codes were an absolute hit with both parents and students. It was like our own little living-museum among a sea of poster boards. Students used the iTalk app to record their stories and uploaded them to a shared Dropbox folder. The .aiff files were converted to .mp3s in iTunes. A Dropbox link for each student's file was placed in a Google spreadsheet template to create QR codes (thank you, Tammy Worcester). QR codes were resized, printed, and placed next to a picture of the student along with a self-created bio. family vacations to the Pacific Ocean, Mexico, and Kenya (to name a few). a grandma who went to middle school with Michael Jackson. a mischievous brother's hijinks involving diaper rash medicine and baby powder. stories about how parents and grandparents immigrated to the United States. favorite holiday traditions, such as making tamales or attending attending special church services. During the event, parents and kids used their mobile devices (or one of the school's iPads) to listen to the recordings. We always have a lot of fun with this project, and it is a great way to preserve history, involve parents, learn something new about our classmates, and bring our community together.